The Prime Minister, Hon. Peter O’Neill said the scale of the Highlands Earthquake disaster is immense, full recovery will take several years, while the immediate focus of the Government remains the restoration of essential services. 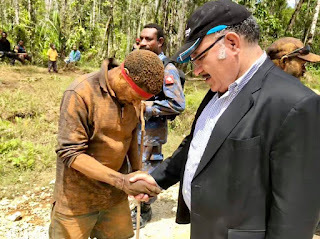 The Prime Minister led a delegation of senior disaster co-ordination officials, security personnel and donor agencies to affected areas in the Southern Highlands and Hela Provinces yesterday to oversee a deeper assessment of logistical requirements. “There will be no quick fix, the damage from this disaster will take months and years to be repaired,” the Prime Minister said from Tari in Hela Province. Speaking with people in both provinces, the Prime Minister thanked partners that are working with Government to deliver supplies, medical support and equipment. “I saw first-hand the massive logistics operation that is being conducted by Government agencies working with the private sector and foreign partners out of Moro Airstrip right now. The Prime Minister said the heartbreak of the destruction is being felt across the affected region. "Tragically, the Highlands Earthquake has already claimed the lives of an estimated more than 100 Papua New Guineans, with many more still missing and thousands of people injured. "The story one mother and her family was particularly concerning, as she had lost six relatives including children. They were from Yalenda village in Kutubu, and with their village now destroyed, have moved to Kemerova village. This is a story of tragedy and loss that that is repeated in village after village throughout the disaster area. The Prime Minister said people must continue to be vigilant with ongoing aftershocks. “There was another major aftershock this morning measuring around 6.7 magnitude. “Aftershocks are likely to continue, and they will cause more damage. The Prime Minister was accompanied by Australian High Commissioner, H.E. Bruce Davis; Israeli Foreign Ministry Pacific Islands Advisor, Yaron Sultan-Dadon; Works Secretary, David Were; Kumul Petroleum Managing Director, Wapo Sponk; MRDC Managing Director, Augustine Mano; Earthquake Emergency Disaster Restoration Team Leader, Dr. William Hamlin; Oil Search CEO, Peter Botton; and, PNG-LNG CEO, Andrew Barry.